Posted on February 19, 2014 by Melinda Pregont, D.C. In American culture, we have become so focused on counting calories that we don’t pay any attention to what we are actually putting into our bodies. We’re all guilty of it. We see those yummy packaged cake rolls that say “50% fewer Calories” or that cereal bar with the “light” frosting, or only “100 calories”. This seems too good to be true! I can eat my favorite guilty pleasure foods without increasing my calorie count?! Why not!? Sadly, it’s far too good to be true. Where you gain in one area, you sacrifice in another, and with these types of “calorie-saving” foods, you sacrifice REAL nutrition. Counting calories will work to an extent, but if you want to drop the size of your waist, and build a sustainable, healthy lifestyle, you must first drop the processed foods. I tell all my clients to get rid of the scales and stay away from “diets”. You aren’t likely to succeed with them and even if you do, you’ll likely struggle to maintain that combination of weight and lifestyle. If you are serious about getting healthy, start by eating REAL food. 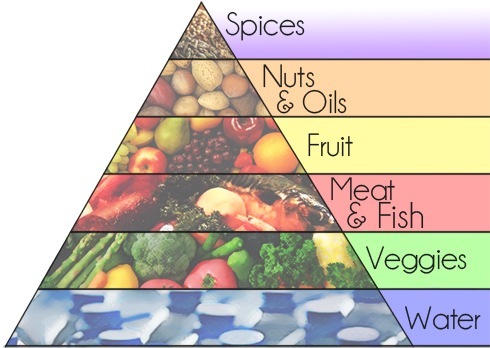 Below is a diagram called the “Real Food Pyramid” that shows what your daily food consumption SHOULD be. Your body will pay it forward by trimming inches from your waist, giving you more energy, and putting you in a better mood! I tell my clients to give yourself a 30 day trial when making a significant lifestyle change. That’s how long it takes to “retrain the brain” and build new habits. Be patient with yourself and know it’s okay if you falter at first – but stick with it and you’ll see the results you desire. So stop. Stop counting those calories. Throw out the weight scale and start eating REAL food.